I think my mom would’ve loved this book and she would have bought it for her granddaughters if it had been around when they were younger. A really special book for bird lovers and bird watchers! 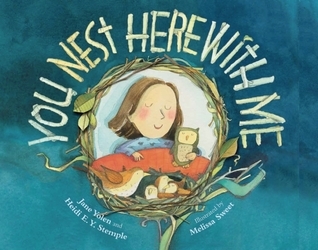 You Nest Here With Me was written by Jane Yolen and her daughter Heidi E.Y. Stemple, and illustrated by Melissa Sweet. It was published by Boyds Mills Press in 2015. My little nestling, time for bed. A lovely example of a rhyming story. I enjoyed the way the rhythm of the story carried me along and showed me different kinds of birds. The repetition of “You nest here with me” is so comforting. It was interesting to read the back matter and think about the four facts chosen for each bird. I’m looking forward to reading this book to my kindergarten students who have been noticing birds now that spring is coming. I liked the facts at the back and the way a drawing of a feather and egg is included, since students sometimes find bird feathers. Build: Collect materials and try to build your own bird nest. Draw: If you could build a nest anywhere, where would it be? Draw a plan to show where you’d build your nest. Discuss: What is your favorite bird from the story? Why do you like that one best? What's not to love about a Jane Yolen book. Many of her books are quiet books. I have not read this one, but I love the refrain "You nest hear with me" -- it is so soothing for kids. I have been reviewing a lot of books recently about birds or characters who are into birding. Hope that means a resurgence in birding among young people. Yes, I've noticed more books about birds too! I hope it's true. More and more birds are becoming extinct or reduced in numbers so the more kids that love birds the better!! A wonderful review of a book I proudly display on my shelf beside me where I write.